What did you think when you realized Zorei was going to keep on kidnapping you and only you? This might sound weird, but I was actually pretty happy. Front-row seats to an alien battle for the win! Besides, Zorei never hurt his past abductees, so I was rarely even nervous. Also, on a pettier note, you should see how easily he gets flustered. He tries hard to hide it, but I’m good at seeing when he’s trying to hide it and even better at making it happen. Did Zorei ever manage to scare you? When he realized people were getting suspicious because he never hurt his prisoners or defeated Kadian, he decided to do something more extreme. I was terrified. I actually could have died that time. And it’s probably weird and stupid, but I actually felt kind of… betrayed. I take it that was the worst part of your adventure? Not quite; I’ve seen worse since then. But to be honest, one of the worst parts of this whole relationship is what a tangled emotional mess it is. Now, I know this is going to sound stupid. Stockholm syndrome and all that. But… I figured from the start that Zorei was harmless. I mean, he was gentle with his abductees, and he was mostly weirdly polite to me. I always got the feeling there was something else behind his abductions, like maybe they weren’t even his idea. So, while we were spending all that time together, and he started bantering back at me when I teased him, and he made that video game for us to play together while we waited for Kadian to rescue me, I… damn, this sounds stupid, given the situation, but I actually started really caring about him. When he finally decided to cross a line, it tore my guts out way more than it should have, and I felt like such an idiot for getting attached. It sounds like there was a surprising number of good things about this situation. What was the best thing about it? It’s hard to pick just one, haha. Man, a lot of the stuff I’m saying in this interview sounds weird. Still, I was part of some great news stories, I had an intriguing mystery to solve, my alien-dating BFF was safe, and I’m getting close to beating Zorei’s high score. It sounds like this friend is pretty important to you. Yeah, she is. To be honest, I didn’t have very many friends when I was growing up; I was too busy taking pictures and looking for weird or cool stories. But Alexa was always there for me. She was kind of shy and got scared easily, and acting like her bodyguard made me feel strong. But she’s also really sweet, and she can be surprisingly brave when she needs to be. What about people who are more than friends? Do you have anyone like that? Haha. The internet being what it is, I know for a FACT that somebody out there is shipping me with Zorei. And Zorei with Kadian. And all three of us together. And of course, I’m pretending to be Kadian’s girlfriend. But in reality, I’m footloose and fancy-free, and I actually prefer it that way. A boyfriend might need too much social interaction for this introvert, y’know? Aside from overly extreme kidnapping shenanigans and excessive social interaction, is there anything you really hate? Yeah, I have my share of pet peeves. Bad grammar, being sent to report on boring stories, and having to stare at the camera when I’d rather be investigating whatever the camera’s pointing at. And, God forbid, people threatening Alexa. Seriously. Do. Freaking. NOT. My favorite drink is hot chocolate, despite the comical complaining of a certain blue alien. My favorite color is red, and some of my favorite pastimes are reading, video games, and researching conspiracy theories on the internet. Hopefully more reporting on cool stories, rehabilitating a traumatized alien, and not dying in all the explody bullcrap that’s happening around me. Let’s see, what in my history of oversharing have I not told anyone? Well… I do have a soon to be not-so-secret fear of being on camera naked. The first week I started working as a reporter, I had nightmares about it every single night. The next day, when I woke up, I almost walked out of the house naked. Then I remembered that clothing doesn’t magically vanish in real life, so there was still a point in getting dressed. Stephanie O’Brien is a lifelong novelist and webcomic artist who enjoys playing with different genres, putting twists on classic tales and tropes, and telling platonic love stories. 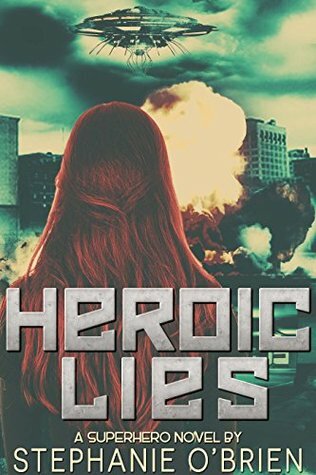 You can find Alexandra on the pages of Heroic Lies. Join us next week to meet woman from an alternate world, who discovers magic is real. Please follow the site by email (bottom-right) to be notified when the next interview is posted.